Ba Br Mumba, you are loving it while hurting inside. Be prepared for what is coming. Ba Mwape … hurting inside? No Sir!!! I am having a kick at this, loving it!!! Why should I hurt inside?? I am an UNIPist with no dog in this fight and only interested in what is good for democracy for the smart people of the Zambian Enterprise. That is like a message well delivered in Roan. Although you win some, you lose some, the Roan Constituency bye election could be a wake up call or a defining moment. Beaten clean. Roan Constituency flips PF seat. Double h is now embodied. He is feeling mellow. Will that win traverse across the Kopala? In Bahati, congrats PF. That was a whooping victory and I hope it wasn’t the empowerment funds. But a win is a win. Democracy served. The people have spoken and therefore, the Ayes have it, the ayes have. You are not loving it. you thought its gonna be your day so you can boast. Here we go you have been taught a lesson never to oust your MPs anyhow and now your seat is gone to opposition. Good lesson!! So all those queues of voters PF was giving K10s, K30s, K50s didn’t vote for them? It’s a lesson to PF. You can’t use money to hoodwink voters. Congrats to clever Roan voters, who have seen that the Kasaka kandalama is empty. PF00Ls have bankrupted Govt. PF taught a political lesson in Roan. Yes PF lost. But what can you do? The people have spoken. It’s all about them. At the end of the day, they want a life. Whoever had a better message carried the day. For the winner, its work from the word go. Otherwise 2021 won’t be smiling. Once again congrats NDC, congrats PF. PF pull up your socks and dissolve those incompetent structures. GBM likely to be replaced by Kambwili as UPNDC alliance Vice President. The entire Cabinet, Mayors and councillors dancing on stage with Lecturer salaries. Only to be rejected by a one man party. PF campaign managers need to look at the strategy again. Maybe next time they should use the old challenger. This is not the first time PF has lost on the Copperbelt. Remember we have had independent and MMD Mps there before. Whilst it is disappointing for PF it is not a clear sign that the province has changed. 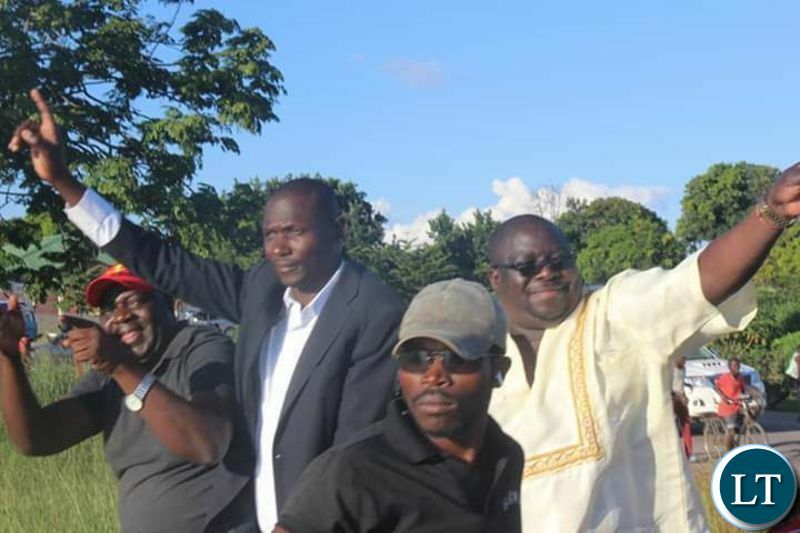 Is the pact going to field Kambwili instead of HH in 2021? That is where the chemistry lies. There will be no pact in 2021. How can you roll when you are a Titanic? The earlier you jumped the sinking Titanic the better for you! The whole Presidency and Cabinet camped in Roan only to be beaten terribly. What value can Minister Of Laughter, Pleasure and Entertainment – Freedom Sikazwe – bring to the campaign team? Wilabepo bufi Mumba your party has lost and you want to pretend you are loving it? Government was even distributing relief food in Luanshya by coincidence during the campaign period. I blame the advisers to the party. What a total embarrassment. ECZ should be disbanded for allowing the relief food gimmick. If you want to catch a thief, send a thief! Kambwili is a pure thief from the thieving PF. He fully understands the thieving tricks by PF. Hence he quickly detected and countered rigging attempts by PF. That is why NDC won in Roan On the other hand, UPND still does not fully understand how PF dribbles them in rigging. In Bahati PF rigged with easy without being detected. What has happened has happened, the door is now open for CK to contest the presidency, at the rate things are going in the country imbwili is fit to be president. This is what happens when you take people for granted…. The entire Copperbelt needs to be turned into a battleground province, that way PF can have competition. Also, we need a very prominent person from the Copperbelt to stand as an independent in the next Presidential Elections. Someone with clout and resources but with great roots in Southern and North Western Provinces because none of the current crop of presidential aspirants can’t win against PF. I am UNIPist and I am interested in making sure we are truly a democracy with real competition in place. May democracy win and congratulations to Kambwili and his team. it always starts with abena COPALA and then Lusaka. That’s a wind of Change coming. Who thought the UPNDC will carry the day. These guys need to work together. You’ll roll to death with PF like a stubborn fly that was buried with a coffin! Well done. It should now dawn on our politicians that people are seeing through the old fashioned useless and violence ridden behaviors of yesteryear. Lies now belong to the dustbin. People want to live their lives not listen to lies all the time. Chishala take a new politics to parliament. @JJP, BAHATI 2016 ELECTION RESULTS: PF 18,166 UPND 4,056, UPND 18.29%. 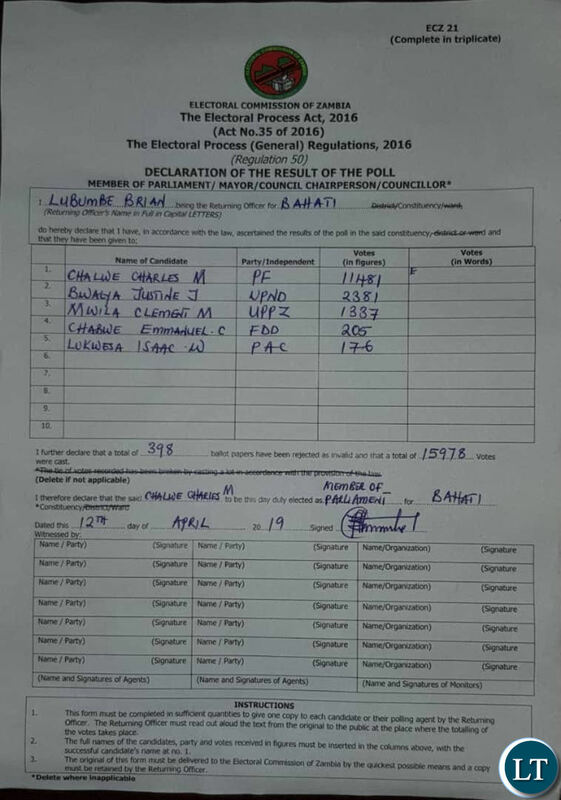 This by-election: PF 11,481 UPND 2,381. In terms of % relative to PF, UPND only managed 17.18%. So which improvement are you talking about? Congratulations to the winner. PF should have been proactive to the plight of the people of Roan rather than wait for elections. All the same the winner should concentrate on the solutions required to revamp LUANSHYA rather than being confrontational. Wishing you the best. Only one can win at a time. Kuwayawayafye. What develpment will Kambwili bring? I can see more insults. Ala nomba elyo twalatukwa. Well people made a choice and it must be respected. This not only about development.What development do you still expect from a bankrupt government anyway.The people of Roan have delivered a special message to the PF which they should not ignore.The burning of a big forest starts with a single match stick.The end has started. This is one of the best happenings in our country. Weldone Kambwili and your NDC. PF is now the most annoying party on the copperbelt and this is not just a one off , it is a change coming to remove PF and MMD.We voted in PF to rid off MMD but down the road Bowman appeared, then Dora, then shared the same platform with Rupia …what an insult to the people of Zambia. Kkkkkkk remember Kambwili won copperbelt for PF almost single handedly, now that he has crossed the floor, the PF with $400 million jets, entire cabinet, kasaka kandalama, all those dull musicians and comedians, still fail to beat UPNDC pact? Housing units being ditched out, clinics, still nothing, wake up and smell the coffee I we Lungu, it’s time to go. Congrats ???????????? ck and team they tried all of them starting from ba president,vice, cabinet,chairmen carders and police commissioner but nothing people have spoken don’t give up gentlemen all the way.will laugh at last. Njimbu and @ Ndanje blind followers what has happened to the mighty PF in Roan kikikiki! We told you the moment clueless EL expelled CK that this is the end of PF but you wouldn’t listen, we told you that we were also true PF members and CK was a force to recon with on the Copperbelt but you were blinded by blind loyalty or may be mulalyamo, this is the beggining of bad things for El and PF on the copperbelt. Create another by election in Kabushi and see how you are going to be thumped kikiki. Viva NDC, viva UPND. UFO ulicipuba, so if defacate in public everyone must do the same. You are blind follower yourself. You don’t understand stand the essence of democracy. You think this guy will change Roan? If you think so think again. 5,000 voted for PF 8,000+ voted for NDC , are these people blind followers? Chovix ebupuba ubo. If you’re a blind follower don’t call others so. It’s my right to support any party in Zambia. Winning an election doesn’t make the lesser citizen. It’s fooools like you that tarnish our politics. The winner is a Zambian and has got all the rights. Where is njimbu ? I told you to remove all ropes from near him, even his belt…. As CK said, this was a contest between CK and lungu where lungu even deployed the whole cabinet to fight CK in luanshya . The people of roan have seen past the dancing and lies on stage. I can see a case where lungu attempts to bribe CK into grz. Ck , lungu and the remnants of PF are soiled with corruption, don’t associate yourself with them. It is a sinking boat. They failed to prove you are corrupt as they alleged , keep true to your self. Okay… great out turns in both constituencies. Congratulations to NDC and PF as well. Let democracy take roots in our country..Amen. There can be no true democracy with PF in Government. Has upnd scooped the roan seat? This election was won single handedly by NDC. (HH) brought nothing to the table. Today NDC is on every one’s lips and UPND is sliding into oblivion. A new party like NDC can easily replace UPND’s 2nd place in 2021 and UPND will be a distant 3rd. Today Kambwili is a saint, in 2021 the UPND will be insulting him. VERY GOOD COMMENTS MOSCOW AND LUNGU WILL DANCE PELETE. HOW CAN A NORMAL PERSON FIRE CK CONSIDERING ALL WHAT HE DID TO PF IN 2016. LUNGU MUST FALL IN 2021. KAMPYONGO AND YOUR FELLOW MINISTERS STOP MISLEADING LUNGU THAT YOU CAN HAND HIM VICTORY IN 2021.YOU ARE COMPLETELY NOTHING AND LUNGU IF HE IS NOT CAREFUL,WILL CRY LIKE RUPIAH. CK CAMPAIGNED HEAVILY ON THE C/B FOR PF IN 2016 AND THE ENTIRE BEMBALA. and infamous kaizer zulu who MCS fired for corruption! I suppose the stuffing scheme helped PF in Bahati. The schemes were well publicised with NRCs being issued in the night. WHERE EVER YOU ARE BR,WE HAVE TOLD YOU MANY TIMES THAT THIS IS NOT THE PF WE SUFFERED FOR WITH SATA AND I CAN ASSURE YOU THAT WAIT FOR 2021 PF WILL SUFFER MASSIVE DEFEAT BY NDC ON THE C/B. IT WAS A GRAVE MISTAKE TO FIRE KAMBWILI BY LUNGU AND YOU WILL SEE WHAT WILL HAPPEN TO PF. I HAVE TOLD YOU THAT DORA,BOWMAN AND ALL THESE MMD MINISTERS ARE NOT DOING ANY GOOD TO PF. THE ROAN BY ELECTIONS WAS CONTEST BETWEEN LUNGU AND CK AND LUNGU HAS BEEN SHOWN THAT YOU CAN NOT TAKE PEOPLE FOR GRANTED. WELL DONE CK AND PEOPLE HAVE FORGOTTEN THAT YOU WON C/B AS SINGLE MAN IN 2016 AND YOU CAN DISMANTLE PF ON C/B AND PF WILL BE NORE. Congratulations NDC.but please remove losers (UPND) from the equation!! 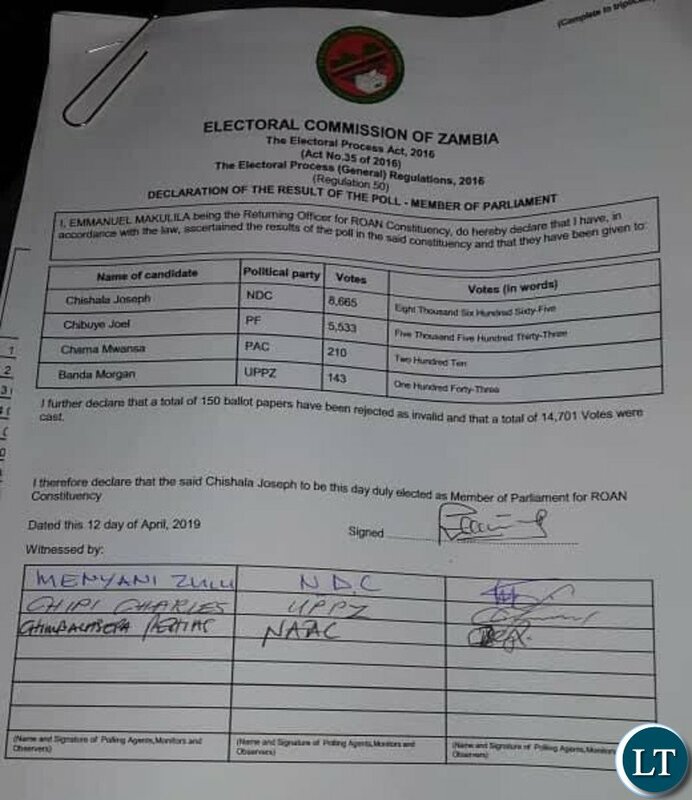 !Kambwili won Roan seat alone because HH only went there for one day.Believe you me,HH’s UPND would have never beaten PF in Roan.BUT YES,KAMBWILI IS VERY STRONG IN LUANSHYA!! !Am a very honest political expert.This is a huge loss for PF and it may have severe political consquences in urban areas in 2021 should Kambwili team up with HH’s UPND! !Kambwili can deliver thousands of urban votes to UPND where HH has failed to win since 2006!! !MOREOVER,THIS COULD MARK THE END OF GBM’S DAYS AS VEEP IN UPND TOO BECAUSE HH WILL BE WORSHIPING KAMBWILI DAY AND NIGHT!!! I beg to differ on your analysis. It was the combined support of UPND and CK’s faithful followers that saw NDC winning. Add to that some disoriented PF members who have been honest with themselves that PF with Lungu at the helm is no longer making sense. UPND faithful followers? Where? Copperbelt? There’s nothing Kaponya (HH) can bring to the table on the Copperbelt. Kambwili got those numbers to NDC alone. UPND has never held a Copperbelt seat. As Njimbu has said, GBM will soon be displaced and (HH) will be kissing the dirty behind of the leopard day and night. Look at the pathetic performance of UPND in Bahati. A new party less than 1 year comes on the scene and they turn tables in Roan. UPND of 21 years still a failure with (HH) as SHlT hole president. In politics learn to appreciate your allies. HH and UPND was definitely a booster to NDC victory in Roan.The two can should supplement each other if PF is to be defeated in 2021. You say so because you want to distabilise the pact. The Fact is that NDC needs UPND and UPND needs NDC for 2021 to go through. CK will lure CB, northern Luapula and Lusaka to NDC while UPND will get Southern, Western,Northwestern, central and Lusaka also. PF will only remain with Eastern kaili bena bashalila munuma lyonse. UPND brought something to the table to help NDC’s victory by NOT putting forward their own candidate, they avoided splitting votes and that helped NDC too. In 2016, UPND had its votes in Road and the entire CB, far better than in the past. It those UPND followers and those who are disgruntled with the PF, combined that gave the NDC victory. So UPND should not be ignored in this victory!! A huge congrats to one Chishimba Kambwili, the NDC Candidate Chishala and the UPND for lending a hand in this very sweet victory. Ladies and Gentlemen, in the game of huge EGOs, Chishimba Kambwili has made Lungu swallow humble pie!! I’m a Luanshyan, and a proud Kopala and I state here that Kambwili one-on-one can white wash Edgar Chagwa Lungu through out the Copperbelt and to the moon and Back; Heavy weights in Politics still do exist… Hint Hint… Roan is a classic example. Michael Sata (RIP), couldn’t lose this seat, Edgar has!! Wapya Munzi!! I was watching wrestle mania in Roan. The undertaker, CK, taking on Mark II and group, ECL and cabinet, MMD and Group, Christian for Lungu and group. “Be magnanimous in victory and gracious in defeat” aptly applies. Now let’s roll as one BR Mumba would say. This is interesting, the entire PF cabinet failed to convince the people of Luanshya to vote for their candidate. A big lesson to them and the entire electorate across the country. The people of Luanshya have done a Donchi Kubeba on PF after all the food and money poured in Luanshya. Well at the end of the day Kambwili has proved his influence in Luanshya and given serious headaches to the PF leadership. But hopefully we shall now return to work and embrace each other as Zambians. The loss of Roan Seat is the beginning of the end for PF and ECL. Correct me, but this is the first time PF has lost a parliamentary seat in a by-election since 2011. Secondly, Copperbelt is a huge determinant in presidential election wins. Yesterday I advised ECL and PF on this forum to ensure that they win Roan, otherwise they should start packing. Copperbelt province is the BEST predictor of presidential election loss, since Kaunda error. The food riots that took out Kaunda’s regime begun on the Copperbelt in 1986; at that time Lusaka people thought Kopalas were crazy, until 1990 arrived. CB has always lead the way, and today PF and ECL are dead worried. No more taking people for granted…otherwise they are on the way out in 2021. Kambwili is popular than Lungu and his Inonge in Roan. where are the following chaps; Sunday Chanda, Amos Chanda, Kampyongo, GRADE 7 Davies Mwila, Mumbi Phiri and Lusambo? They dared Kambwili and Davies Mwila offered to resign should NDC win Roan. The president has been embarrased by one man Kambwili they worked day and night to finish. What the president has caused on himself is a big shame after all the bribes and shifting of entire cabinet. And Charity Katanga and ZNBC. PF wanted to win roan at all costs, the aim was to punish ck and also make the alliance look meaningless, but the alliance is a thousand feet ahead of them, i wish kalaba would have taken the NDC route, he could have also been talking of his DPs first Parliamentary seat, let him come down to earth and be part of the alliance. I am told UPND has also scooped Bahati? Luanshya is like that. The voters think independently. Remember that after 1996 one of the few, if the only one, UNIP MP was in Roan, Cameron Pwele. This is not new. Keep comforting yourself and your deluded PF leadership. RB literally cried when he realised the lies he had been comforted with! Keep your arrogance like how your campaign manager in Roan, one Bowman displayed. Imagine a so called campaign manager seeking for votes, going to the mall and having his ‘mimbulus’ chase the people from the shop he was entering saying you are CK’s people move out the honorable wants to enter! Such thuggery and you expect to win? Continue your self destruct mode enough is enough! Sensible voters will not vote for PF because Kasaka has spoken or dramatized the campaigns, neither will they vote because JK has danced. They know that these chaps are getting paid and given a chance they would not vote for PF. Using these morons during campaigns is clearly fooling people who are hungry, not getting paid, not able to send children to school etc. Sensible people will not vote for PF because the OVER RATED KAIZER ZULU has brought a K10.00. This is what the sensible people of Roan have observed. Congrats Kambwili and UPNDC. What is total cost of ferrying the president , vice president, ministers, MPs and cadres to luanshya for the bye election? On top of dishing out millions to try and buy votes…. Sensible voters will not vote for PF because Kasaka has spoken or dramatized the campaigns, neither will they vote because JK has danced. They know that these chaps are getting paid and given a chance they would not vote for PF. Using these morons during campaigns is clearly fooling people who are hungry, not getting paid, not able to send children to school etc. Sensible people will not vote for PF because the OVER RATED KAIZER ZULU has brought a K10.00. This is what the sensible people of Roan have observed. Congrats Kambwili and UPNDC. Tiye nayo…. This the star comment of the day. True that. This is the bitterest, most painful,most shameful,most expensive loss ever inflicted on any political party and President in power in Zambia`s political history.The whole PF is in mourning.CK and his NDC, with very little at their disposal, have delivered the special message that PF has been refusing to accept from many quarters: “You will not perpetually buy political power with money and corruption of the electorate”.PF should count the cost.One man, Kambwili, will cause threir downfall. He initiated their down fall right from day 1 they dubiously expelled him and by buying Musenge to force eject CK from parliament.They were not comfortable with CK’S presence in Parliament gave them headaches!But I am shocked with the way mumbi phiri and jean kapata have turned against CK!!!! But CK was the best of them all, especially against apf team members. @ Ayatollah, my take exactly. I think that PF has become complacent and deal with people with impunity failing to LISTEN. Look how they are treating late salaries for civil servants not even apologetic nor scratching their heads for alternatives. How you connect to people matters, and in that Kambwili has taught them a lesson. Just shows how little you have been following the elections. Joseph Chishala has been a unionist and one of the spokesperson for the miners who lost jobs due to the so-called chinese investors. He’s a man of the people and NDC made a very wise decision in picking him. PF started losing ground on the Copperbelt way before these elections and if they do not change or remain as stubborn as they have become, someone shall shed real tears in 2021…. Never again allow a large character to setup his own mini PF govt in any constituency. Start working now. A strong Secretary General who can mobilise the PF is an absolute necessity. The SG must see to it that PF members serve PF . I guess you need to rap into the psychology of the people of Roan and get in there before general elections….get working. Over to you SG, get growling discipling your MPs and please, don’t let complacency seat in treating people without LISTENING TO THEM. This was just a bad gig….man!!!!!! No one can hold on to power for ever. This was always coming. When people get tired of you, they get rid of you. Lets put elections characterised by maiming people away because clearly this win for ndc shows people can still independently make up their own mind despite coersion or briberly. When a leader fails to inspire then he or she becomes irrelevant and a non factor and he or she should know that their time us up. Lungu is carrying too much dead weight, he needs to let some people go blind loyalty is catastrophic, as president you dont owe a favor to anyone whom you know is puling you down, cut them lose. Your duty as president is to the people and not to a person this loss in roan should clearly wake you up. CBU students must be so glad. Thanks Mr Prof Luo s bad timing. Please don’t mix issues. If you think supporting students who riot for failing an exam, then I am afraid the country is headed for worse times than now. Besides PF has won all by elections held yesterday except Mungwi which has gone to FDD. Real democracy is where different parties win representation. Congrats Zambia! Democracy has won! We must cherish moments when results are announced and candidates accept defeat without question. Well done NDC and PF in Roan;and well done PF and UPND in Bahati. I would like to see more such maturity in our democracy. Democracy need diversity of views and ideas to drive the Zambian enterprise forward. But please no one MP, councilor or Mayor must die. We have not money for by-elections. We must amend our constitution to avoid this expensive aspect of our democracy! God bless Zambia! Any one can lose elections but we all know that NDC is only Kambwili while PF is the entire govt machinery and it still loses to the influence of only one man? This is very serious.PF has only two things to do, either it puts its house in order or it starts packing. As for NDC, this is not the time to start fighting with PF in parliament but to use this golden opportunity to show the public how you will be debating in parliament concerning national matters. This a very timely free advice!CK, coach him how to handle debates in parliament as an opposition.He must not behave like upAndOWN- walking out or boycotting presidential address. That’s how unip died,boycotted elections because of one man! !Baba mu intesive care unit since 1996!! “All Politics are Local. An independent MP here and there or a son of the soil here and there does not change the overall Political Landscape otherwise NDC would have scooped all the Ward bye-elections as well. Question is, would the people of Roan vote for Kambwili as President of Zambia or worse still Darth Vader? For Pf, be very cautious – the way you have allowed KCm to neglect local businesses will be your downfall. I see Kambwili going there to blast Argawal – and you are finished in Chingola / Chililabombwe too. Thankfully it is NDC and not a tribal grouping that is gaining momentum. So Zambian bloggers…please help. Would it be safe to assume that Bahati voted on tribal lines or does that only apply to Southern, Western and N/Western province voters?? Thorn in the Flesh is the best person to answer your question. Ba denkede ck is one of the hard working mps we v ever had. Maybe you haven’t been to luanshya and survey. He has done alot. Even his party winning is because of his works. Imagine you pay people to vote for you,distribute ubunga,t shirts cash money etc and end up losing to a newly formed party. Pf assembled all the cabinet ministers to camp in Roan but still lost. What I can say is that he can win alone that’s a big noo,if upnd they hard any one to stand in by-election pf could have won that by-election now that upnd didn’t stand and supported NDC in that by-election all upnd supporter’s combined with NDC supporters to beat up pf so to me that’s a know 8000 plus votes divide them by two parts then compare them with one part which is of with 5000 plus votes.you know if your child is a failure can you go in class and help him/he to write an exam?if he his/she his a failure nomatter what you can do he/she is a failure.